Last year I received the most amazing gift in the mail. 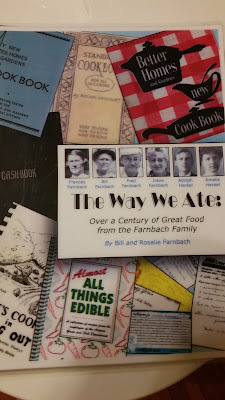 My uncle and aunt had compiled a book out of all my grandmother's recipe boxes and most used cookbooks. The book has inspired me to cook a few things, including the stollen I'll be posting about closer to the holidays, and I wanted to try another recipe from it this week. 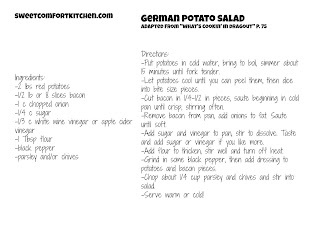 This potato salad is in the traditional German style, sweet, sour and salty from the bacon. It's not for all tastes, but I've always really enjoyed it. 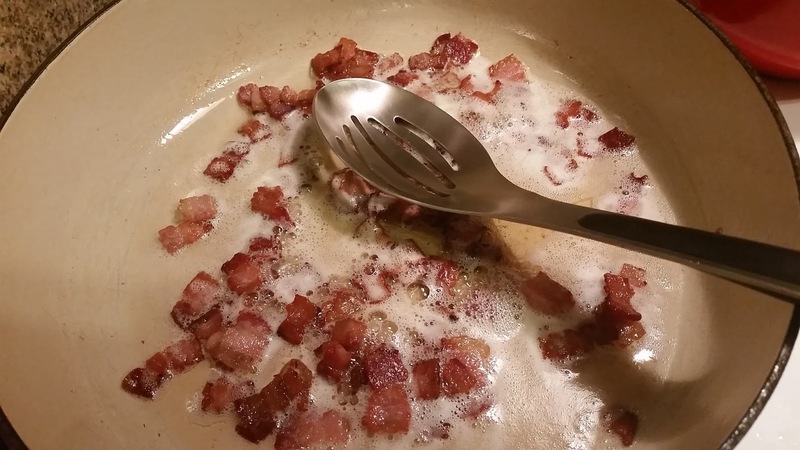 The use of the fat from the bacon in the dressing reflects the use everything and throw away nothing values I'm trying to bring back to my kitchen. It's only very slightly adapted from my uncle's beautiful collection pictured below, and came from What's Cookin' in Dragout, a collection of recipes from the village of Kampsville, Illinois, where my grandfather was from. Kampsville was a rural area back when Grandpa Fred was growing up, and even today it has a population of less than 400 people. Original recipe by Vera Steinberg. Put the potatoes in a pot and cover them with cold water. 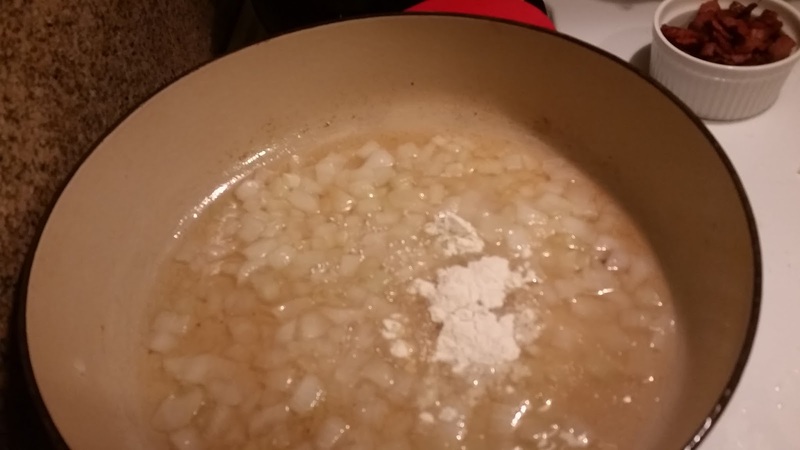 Bring the water to a boil, add 1/2 to 1 tsp salt, then reduce to a simmer. Cover the pot and boil about 15 minutes or until fork tender. 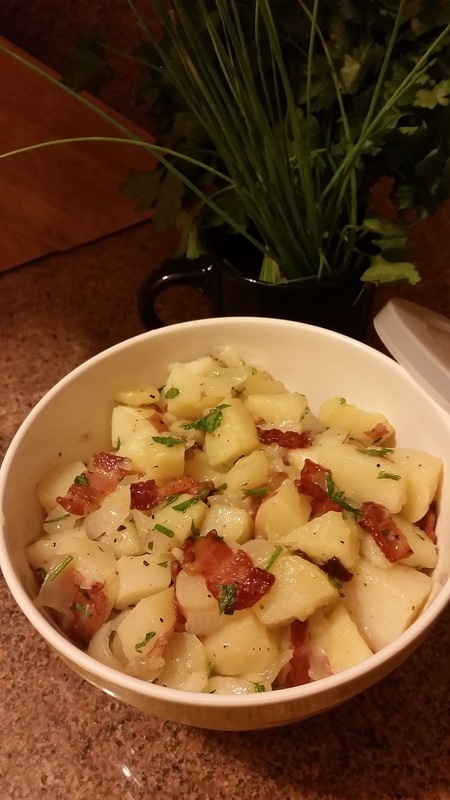 Drain potatoes and cool about ten minutes until easy to handle. 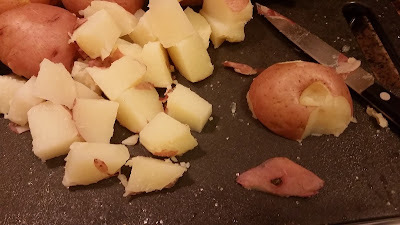 You can peel the potatoes completely, or just cut off any eyes or funny bits you see. Dice the potatoes into bite-size pieces. 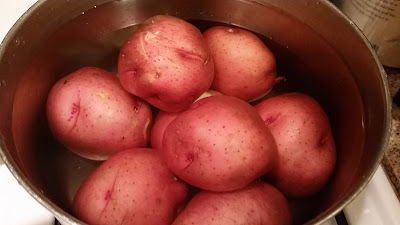 Put them in a medium-large bowl with room to toss them in the dressing. If your market carries slab bacon, get a 1/2 lb piece and dice it in 1/4 to 1/2 inch cubical rectangles, more commonly known as lardons. 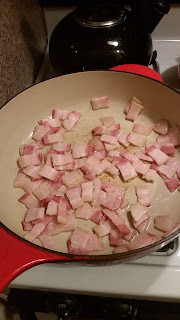 I went to the other market today that only has pre-sliced bacon, so I used 8 slices of thick-cut style, cut in half-inch pieces. To crisp up the pieces and render out the fat, put the pieces in a cold heavy pan over medium heat with a teaspoon of oil to get them started. Cut one smallish onion or part of a bigger onion (about a cup chopped) into 1/4 inch pieces. You know, roughly. A little bigger, a little smaller, no big deal. Add the onions to the fat in the pan and saute over medium low heat until soft. It looked like a lot of fat, so I let the pan cool enough to measure it. 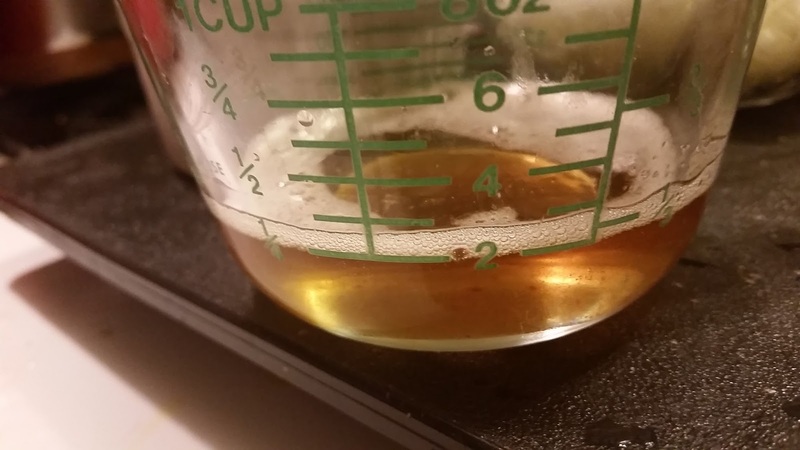 It was just 1/4 cup, an amount nobody would balk at if it were olive oil! When the onions are soft, add 1/4 c sugar and 1/3 c white wine vinegar (apple cider vinegar is also great). Stir until the sugar dissolves, then add about 1 Tbsp flour and stir in to thicken it a bit. Taste it to see if you want to add more sugar or vinegar (I added a teaspoon or so more vinegar). Add a nice grinding of black pepper and then stir the dressing into the potatoes and bacon. Finally, finely chop 1/4 c total of parsley and/or chives and stir in. Serve warm or refrigerate for morning...this is coming with me to another music-filled picnic tomorrow. I'll probably stir in a bit more of the herbs before I go. 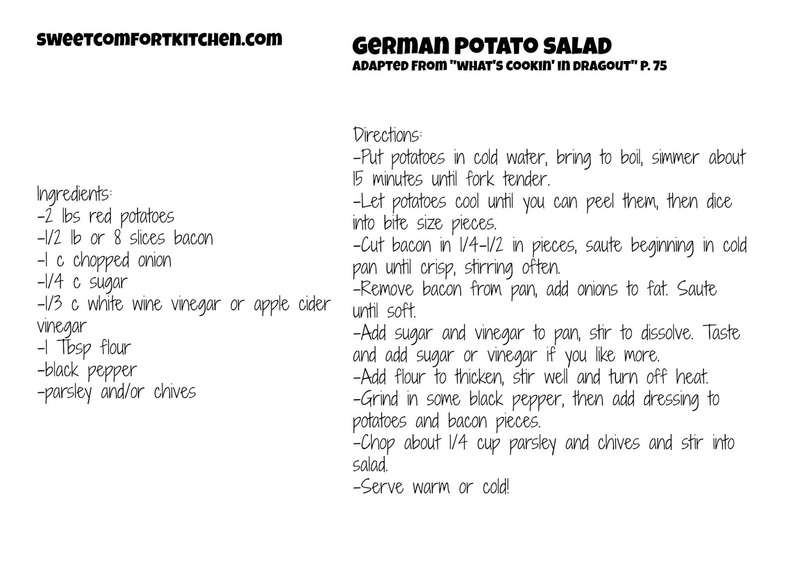 To print recipe, right click on recipe image below.